At Changelly we do not alter the tradition to issue publications on the most vibrating crypto topics. So today we would love to suggest you read our fresh interview with another prominent crypto-enthusiast, whose company, in particular, have recently partnered with Changelly space team. Paul Puey, CEO and Co-Founder of Edge — a fully user-controlled, non-custodial multi-currency wallet. Paul is here today to clarify some Edge concepts and to share his highest hopes for the crypto industry further development. Changelly: Hello, Paul, and thank you for interviewing with Changelly! Let’s start our conversation with the most urgent crypto issue to date — the security issue. There are many discussions around the security and anonymity subject in crypto industry. At Edge, you walked ahead by developing the theology of “Edge Security.” Can you clarify this concept for us? Paul: Sure. The concept of “Edge Security” is to secure data at the “edges” of the network. Not relying on centralized servers and companies, but using encryption on end-user devices so that ONLY the end-user has access to their data. This greatly reduces the trust on central services. At Edge, we don’t have access to users private keys, funds, account info, or any personal info. Everything is encrypted client-side “at the edge”. Changelly: The other idea which you’re standing for is the idea of simplicity. According to that can you please give us an overview of the Edge Core work principles in simple terms? Paul: Many companies and projects claim “ease of use” or “simplicity”. But this can be defined differently by different people and many disagree on what that means. Edge defines simplicity with “familiarity”. We build a user experience to secure cryptocurrency that feels just like creating a regular account and logging in. With 2FA, password recovery, biometric, and PIN login, it truly feels just like any other account, but is non-custodial, encrypted, and secure enough for cryptocurrency. Changelly: What is your attitude to a total KYC implementation, enforced by some governments, considering that it runs counter to your project’s philosophy? Paul: KYC requirements are the biggest cause of security issues and identity theft today. We end up placing tremendous trust in multiple centralized services to secure our most sensitive personal info. It compromises more innocent people than it helps catch “bad-actors”. KYC is the unfortunate reality of our financial world. We expect that crypto services that mirror legacy financial services will likely be forced to comply with KYC requirements. The further away from “traditional financial services” a company or project positions itself, the less it will require such regulations. We imagine with dapps, smart contracts, better decentralized exchanges, as well as competition from countries with low to no KYC requirements, we’ll see this requirement slowly fade as crypto gets true wide adoption and effectively bypasses legacy systems. Changelly: Recently you’ve implemented Changelly’s API inside Edge wallet, allowing people to exchange their crypto assets within the wallet interface. Can you share with us some further steps of the wallet development? 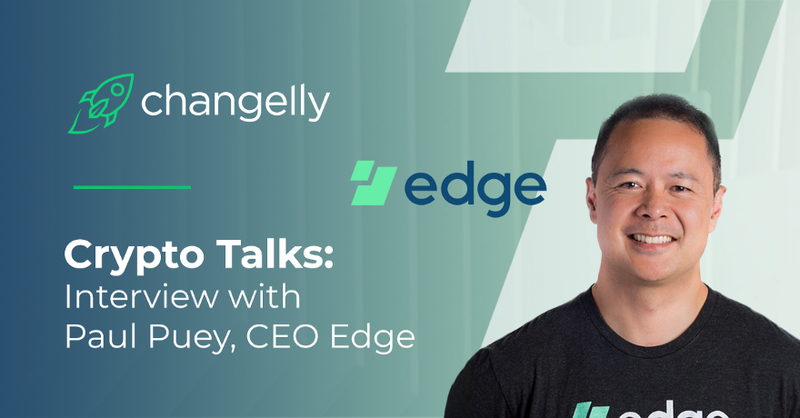 Paul: We’re excited to implement Changelly into Edge as it gives our users a great service that requires little to no KYC for most trades and more importantly offers a tremendous amount of currencies for users to exchange between. Users can expect to see more currencies supported in Edge which will nicely align with the cryptos supported in Changelly. As well, we aim to add more fiat-to-crypto exchanges which will give people easy and cheaper on-ramps which nicely complement Changelly’s service of converting between cryptocurrencies. Changelly: Do you have plans to release your own token or maybe run some kind of ICO? Paul: Edge does not currently have any plans to issue an ICO. If we did, it would likely be offered as a security token under normal US SEC securities offerings. While we believe many projects benefit greatly from a utility token (such as Augur), many projects like Edge and other wallets would only hinder the user experience by requiring a token to be used in the system. We believe in building a great product first and not being hindered by a token in our system. Changelly: What’s your attitude to stablecoins? Do you believe it may improve the volatile nature of the crypto market or it’s just another attempt to tie crypto to the material world? Paul: Stablecoins fall under two categories, asset backed coins, and algorithmic stable coins. Asset backed coins are inherently no different than a bank. They do not provide any additional utility that we couldn’t do with a PayPal. In the short term, they have been able to skirt regulation and not require KYC for transfers around the world. I expect that to change in the near future, and asset backed coins will soon have the same friction as a bank transfer. Algorithmic stable coins however, such as MakerDAO, provide a unique ability for us to transfer value pegged in almost ANY asset via a permission-less, globally accessible blockchain. However, these systems are new financial tools that have not stood the test of time. I expect some solutions will survive and will provide a huge utility in the long term future of cryptocurrency, but will not replace truly free floating value crypto that is not pegged to any asset. Do not deny yourself of reading our Stablecoin material, which unpacks the concept of stable crypto-assets and includes the experts’ views on this urgent topic. Changelly: This one will be pretty standard: what are your expectations regarding the crypto market? Should we all wait for another hype like the one that happened last winter? Paul: No we shouldn’t wait, we should charge forward. VCs should invest in the projects that build our future. Founders should keep building and improving UX and products. Users should drive adoption and insist on getting paid and in paying using crypto. We now have a multitude of cryptocurrencies and suite the various use cases and great services like Changelly that let us convert between them seamlessly when the need arises. Changelly: Do you think that someday the economy will be run on crypto only? Or traditional banking institutions will never allow that to happen? Paul: I absolutely believe the economy will be crypto-only. Changelly: If you’re up to sharing this, what do you think about “living on crypto” lifestyle and do you live on crypto yourself? Paul: I mix my living between crypto and fiat. I’ve on boarded over a dozen different crypto merchants but realize it is still hard to use crypto for daily life. I pick my battles and my forte is building products to drive adoption. I let the charismatic evangelists drive adoption at the individual level using the tools that Edge, Changelly, and other companies build. Previous Post:My Transaction Is Stuck. What To Do?